Holiday Fun in Muskegon with the Singing Christmas Tree! Travelers seeking unique holiday fun should look no farther than Muskegon, Michigan, home to America’s tallest, singing Christmas tree! Every year, thousands of hours are spent planning and preparing for the event by local students, teachers and parents from Mona Shores High School. 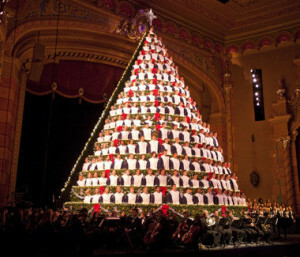 The end result: a living, breathing Christmas tree that stands five-stories tall and holds more than 200 singing students! The Singing Christmas Tree is a sight to see! Hour-long practices begin just after Labor Day as students prepare songs like, “Have Yourself a Merry Little Christmas” and “Rudolph the Red-Nosed Reindeer.” As the event draws nearer, the 67-foot steel tree is set up on the stage of the Muskegon Frauenthal Center for Performing Arts. Hundreds of volunteers place the 850 pieces of steel to build the tree frame, orchestrate and dress up the students, and decorate the tree with over 5,000 feet of garland and 25,000 twinkling lights! The student at the top of the tree, known as “The Tree Angel,” is a high school senior nominated by the choir director. Most students can’t wait to move up the tree, as they start at the bottom as freshman and move closer to the top each year. Over 5,000 people kick off their holiday season every year with a visit to the tree. This year will also feature a new look thanks to an updated structure and more LED lighting. The 2015 performances will be at 7 p.m. on December 3, 4 and 5 with an additional matinee performance at 3 p.m. on December 5. Tickets are $15 and can be purchased here. Travel to Muskegon with SkyWest Airlines flights, operating as United Express, from Chicago O’Hare. Find the best fares at united.com.